Karai’s plane has arrived in the United States, and she boards a helicopter that takes her to Foot headquarters, an imposing skyscraper in New york City. Casey and Gabby are watching a romantic sunset. Gabrielle announces that she’s getting hungry and wants to head for home, but before Casey starts their Jeep, he produces a ring and proposes. Gabby accepts Casey’s proposal and the two are engaged. April is having dinner with a slick weasel with a ponytail. The man brags about his programming prowess and then grabs April by the knee. O’Neil throws her coffee on the fellow and storms out. As she walks home, April reflects on how much she dislikes California. Master Splinter is awoken by a voice, insisting that the old rat must eat if he’s to survive. The Sensei tells the voice that he has nothing to subsist on. “There is little nourishment in riddles, shadow.” states Splinter. “The riddle is yours… that which can sustain you is within your reach… but not yet within your grasp.” the Voice notes. “I’m hungry… cold… in pain… and yet you torment me. You are death.” concludes the Sensei. Leonardo encourages his brothers to go on a training run. Raphael is not interested, but after some cajoling, he agrees to go along. The old man is sitting up at the hospital, gazing longingly at the shuttered window. 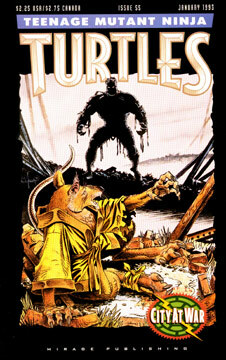 As the Turtles jump from rooftop to rooftop, Raphael steps in some dog dung. This enrages Raph and he angrily stalks off towards home. As Raph makes hi sway back, he’s ambushed by one of Shredder’s Elite Guard. Raph is badly cut on the face, but he manages to severely wound the Elite by stabbing him in the side with a sai, thus taking the Elite out of action. Leo, Mike and Don arrive just as the fighting ends. The Elite gazes up at Leonardo. “Y-you… you are the kappa… that killed my Master… Oroku Saki!” he stammers. “I am… duty bound… to slay you… to… avenge my Master…” the man croaks. “I think your avengin’ days are over, pal.” notes Raph. “Perhaps… in the next life…” notes the Elite. With this, the Elite Guard commits seppuku. Master Splinter continues arguing with the Voice. “Who are you!! ?” Splinter demands. “I have had several names,” comes the answer, “But considering the circumstances, perhaps none is more appropriate than this… you may call me… the Rat King.” Rat King first appeared in Tales of the TMNT #4.